Marchionne: "This is still a very fragmented industry for the level of capital you have to invest." Sergio Marchionne likes to move fast. The Fiat Chrysler CEO owns a half-dozen Ferraris, has homes in three countries, and spends much of his time on a private jet shuttling between Detroit, Fiat's hometown of Turin, and other outposts of his growing empire. 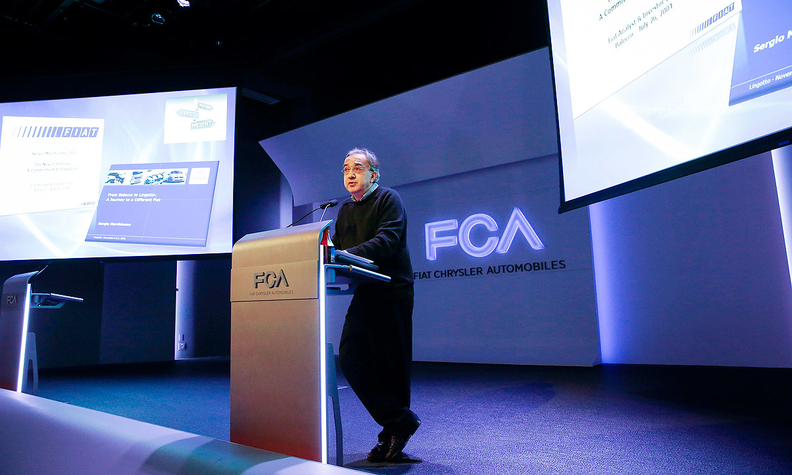 Fueled by a dozen espressos a day and packs of Muratti cigarettes, he stormed into Fiat a decade ago and fired most of the top management, then did the same at Chrysler in 2009, installing a dozen newcomers on his second day. And on a recent gray Tuesday morning, Marchionne took one of his Ferraris -- a black Enzo -- around Fiat's high-speed test track near the town of Balocco, 40 miles (64km) east of Turin. "When you're pissed off," he said, stamping on the accelerator and pushing the car from a comfortable 120 miles per hour (193kph) to something over 200, "there's nothing better than this." As he and Fiat Chairman John Elkann prepare to ring the closing bell at the New York Stock Exchange on Oct. 13 to mark a new listing, Fiat Chrysler Automobiles, Marchionne is racing to create a lineup of cars that will lure buyers into showrooms worldwide. By 2018, the combined company plans to spend about $60 billion adding more than 30 models, from subcompacts to a Maserati SUV. That, he predicts, will help the new company boost sales 60 percent to 7 million cars and churn out a profit of 5 billion euros ($6.3 billion). "We're moving as fast as we possibly can," Marchionne said after his spin around the circuit's banked curves. Marchionne would be the first to tell you speed can be dangerous. "In the car business, sometimes you crash," he said. He should know: In 2007, he smashed up a $350,000 Ferrari on a highway in Switzerland. Yet he argues that moving any slower would be even riskier. Fiat Chrysler is the world's No. 7 automaking group by deliveries, and Marchionne has long said there's room for just a half-dozen or fewer major players. The transatlantic marriage of two struggling regional carmakers will probably be the capstone of Marchionne's career. He says he's only committed to staying at Fiat through 2018. So how quickly he gets the new company on its feet during these last laps may well determine his legacy. "The idea of revitalizing an American company was particularly appealing to him, and you can see it in how he's built up Chrysler," said Ron Bloom, a member of President Obama's auto-industry bailout team who recalls sharing cigarette breaks with Marchionne on a Treasury Department balcony overlooking the White House during Chrysler talks. Marchionne's plan has legions of doubters. Half of the analysts who cover Fiat recommend investors sell the shares, saying the CEO's sales goals are unrealistic and its 10 billion euros in debt is too high. Researcher IHS Automotive forecasts the company will fall short of its 2018 targets by about 1.8 million cars. "Are they really going to launch all those models?" said IHS analyst Ian Fletcher. "And to develop new models is one thing; to attract customers is another." Sipping espresso on the veranda of the 19th-century farmhouse at the center of the Balocco track, Marchionne said: "I'm used to incredulity." He sets ambitious targets, he said, because aiming lower would be "to establish mediocrity as a benchmark of the house. If you dream of peanuts, you get monkeys." A poker fanatic who insists that passengers on the Fiat corporate jet play cards with him deep into the night, Marchionne has a record more as a dealmaker than an automaker. In the past decade, he has pulled both Fiat and Chrysler back from the edge of bankruptcy. In 2005 he played a game of chicken with General Motors, threatening to enforce a contract that would have required the struggling American company to buy even-dodgier Fiat; he walked away with a $2 billion cash settlement. Four years later, he took over Chrysler, ultimately spending only about 10 percent of the $36 billion Germany's Daimler AG paid for the company in 1998. He's been less successful with cars. Marchionne ditched the storied Italian brand Lancia after trying to rebadge Chrysler models as Lancias for sale in Europe. He was late to China. And despite initial promises of bringing Alfa Romeo back to the U.S. as early as 2011, the sporty luxury brand won't get there until 2016, with the exception of a two-seater to be introduced this year but won't generate sales of more than 1,000 units. Marchionne acknowledges that he was new to the auto industry when he took over Fiat, but points out that he's now the longest serving CEO of any major European automaker. "I'm a car freak," he said, looking over the lineup of Maseratis and Ferraris under the portico of a converted stable at Balocco. "But my survival instinct is stronger than my addiction to cars." That survival instinct has led him to largely abandon the mass market in Europe, which he says is too crowded to offer a significant profit. Instead, he wants to transform Fiat's under-utilized Italian plants into export machines for more expensive cars. In 2000, Fiat made 1.4 million vehicles in Italy. By 2013, its Italian output had dropped below 400,000 as Fiat wound down models that compete directly with best-sellers like Volkswagen's Golf. "We did a lot of soul-searching to try to see how best to utilize what we had in Italy," said Marchionne's boss, Elkann, the great-great-grandson of Giovanni Agnelli, who founded Fiat in 1899. The two make an unlikely team. While Marchionne is always ready with a quick riposte sprinkled with profanity, the gangly, 38-year-old Elkann speaks slowly, as if every word has been squeezed through a filter. At Balocco he's wearing a pin-striped suit with a red sweater vest and blue tie; he rarely appears in public with an open collar, a sharp contrast to Marchionne's trademark black sweater and dark blue slacks. As the scion of the Agnelli family, Elkann is almost like royalty in Italy and a constant focus of the tabloid press. He drinks tea instead of coffee. He doesn't smoke. And he owns just a single Ferrari. Despite their different temperaments -- and their 24-year age difference -- Elkann and Marchionne have "a very easy relationship," said Bill Ford, the grandson of Ford Motor Co. founder Henry Ford, whose family has known the Agnelli clan for more than 50 years. "It can be awkward when you're the boss of someone much older," said Ford, who hosted the pair at a dinner at his house along with then-Ford CEO Alan Mulally. "I've been impressed that that's not true with those two." Elkann and Marchionne say they fire off dozens of BlackBerry BBM text messages to each other daily -- mostly in English, despite their shared Italian heritage. Elkann, who took over management of the family's holdings at age 28, says Marchionne has taught him to be flexible. "You can't plan everything," said Elkann. "We've learned that serendipity is real," Marchionne echoes in his gravelly voice punctuated by a smokers cough. "S**t will happen." Some executives who know both men say that they have something of a father-son relationship, but Marchionne said, "he's more like a kid brother." The brawny Jeep brand is central to their plan. Marchionne plans to start building the Cherokee SUV in China by 2016 as he seeks to double sales to more than 1.9 million vehicles, largely by quintupling deliveries in the world's most populous nation. The Jeep name, Marchionne says, "is credible, and is understood by everybody." And he expects Alfa Romeo and Maserati to steal buyers from BMW, Mercedes, and Audi. The Germans' reputation as makers of higher-quality cars than the Italians "is just crap," Marchionne said, stubbing his cigarette into an ashtray. Elkann, right, and Marchionne fire off dozens of BlackBerry BBM text messages to each other daily -- mostly in English, despite their shared Italian heritage. What's important is to ensure each brand stands for something. That's easy with Ferrari: Really fast cars that can cost more than the average worker earns in a decade. And it's not tough with Alfa, Maserati, Jeep, or even Dodge, which is being refocused around the muscle-car roots of sportsters like the Charger and Challenger. Most troubled are the company's namesake brands. 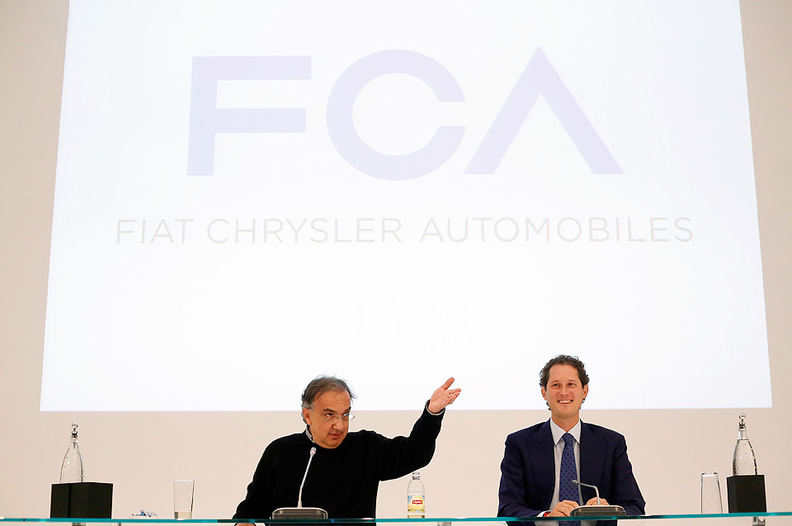 "Fiat is the toughest nut in Europe and Chrysler is the toughest in the U.S.," Marchionne said. Chrysler, which previous management had sought to position as a near-luxury nameplate, is being shifted downmarket. A new sedan called the 200 -- best known as the car driven by rapper Eminem in a 2011 Super Bowl ad with the tag-line "Imported From Detroit" -- has been well-received. But the brand has only three models, and U.S. sales have dropped 6 percent this year. Fiat is buffing up its image in the U.S. and Europe as the maker of the retro-hip 500, intended as an answer to BMW's Mini range. The problem is that the identity is muddled elsewhere. Brazil, for instance, now builds more Fiats than any other country, so "when a Brazilian goes to New York and sees a Fiat, he says, ''Hey, there's a Brazilian car,'" Marchionne said. At the Balocco test track, Marchionne and Elkann are eager to show the cross-pollination of their brands. In the farmhouse courtyard a Jeep Renegade sits next to its Italian cousin, the 500X, both to be built at a Fiat factory in Melfi, 100 miles east of Naples. "This is a real SUV," Marchionne said, slapping the tailgate of the diminutive blue Renegade. "It'll take you anywhere." The two vehicles share a "platform," which means most of the stuff you can't see -- engine, axles, air-conditioning ducts, window-winders. Roughly speaking, it costs $1 billion to take a car from designer's sketch pad to dealer's showroom. Adapting a platform for a new model can be done for less than $300 million, Marchionne says. Though the two cars look nothing alike, Fiat says they share about 40 percent of their components. The Renegade is boxy and muscular, with a wide stance and six-pillared Jeep grille that make it look like it just forded an Idaho stream even if it's on a crowded Shanghai street. The 500X, while also featuring four-wheel-drive and the higher profile of an SUV, has the seductive curves of the original Fiat 500 and is intended to ooze Dolce Vita insouciance whether at a mall in Chicago or on the Via Veneto in Rome. "This is urban, civilized," Marchionne said, running his hands across the cream-colored five-seater. "It's Italy at its best." Marchionne has a deep understanding of the cultural barriers that separate the Italians and their American partners. He was born in Chieti, a hill town about two hours east of Rome (in a Fiat 500; maybe half that in a Ferrari with Marchionne at the wheel). At age 14, his parents uprooted the family and moved to Toronto, where Marchionne learned English from a standstill. After studying philosophy, law, and business, he worked as an accountant in Canada. Marchionne consolidated his reputation at SGS, a Swiss product testing company, where he doubled profits by cutting costs and eliminating several layers of management. SGS was controlled by Elkann, known as Jaki to most of the 100 members of the Agnelli clan whose billions he oversees. In 2004 Elkann was looking for new leadership at Fiat, which had lost more than 6 billion euros over the previous two years, and he took note of Marchionne's success at SGS. That May, he met Marchionne for dinner at Geneva's lakeside Hotel de L'Angleterre. Over coffee and grappa, Elkann floated the idea of Marchionne running Fiat. "He never asked me to work for him," Marchionne said. "He asked me if I could lend a hand, and that's why I said yes." Though the new company will trade in New York, it will be registered in the Netherlands and its headquarters will be three floors of a 1960s tower on St. James's Street in London. Fiat opted to make one of the world's most expensive neighborhoods its official home to save money: The U.K.'s corporate tax rate is slated to fall to 20 percent next year, while Italy's corporate rate is 31.4 percent and in the U.S. it's about 40 percent. The Dutch registration lets Elkann take advantage of rules that supercharge the vote of a controlling shareholder. Exor, the Agnelli vehicle that owns 30 percent of Fiat, will have about 40 percent of the new company's voting rights. Elkann must shoulder significant historical weight as he oversees Marchionne's shift away from Italy. Fiat's name, after all, is an acronym for Fabbrica Italiana Automobili Torino, or Italian Auto Factory Turin. And Elkann occupies an office inherited from his grandfather, Gianni Agnelli, a swashbuckling legend of European society pages known to virtually everyone in Italy as "L'Avoccato" -- The Lawyer -- more than a decade after his death. The country's biggest union, CGIL, has criticized Marchionne's plan as an abandonment of Fiat's Italian roots and the workers who made the company strong. Diego Della Valle, chairman of shoemaker Tod's S.p.A., has long said Marchionne seeks only to enrich himself at the expense of workers. He reiterated those criticisms on "Otto e Mezzo," a popular evening TV talk show, on Sept. 26 just as Marchionne was holding a press conference with Italian Prime Minister Matteo Renzi six time-zones away near Detroit. Della Valle called the Fiat chief a "sola" (a Roman curse that in polite company might be translated as "liar") who "doesn't respect any commitment." Marchionne's response: "I found it offensive. The problem with this country is that everybody is an expert." Marchionne has support at the highest levels in Italy. Former Prime Minister Mario Monti helped him inaugurate the production lines that will make the Renegade and the 500X. And Renzi on Sept. 26 spent the afternoon with Marchionne at Chrysler headquarters. After a tour of the facility, Renzi said Marchionne's turnaround of Fiat could serve as a model for all of Italian industry. "The most important thing is not the headquarters and where they hold their annual meeting," Renzi said, "it's the strategy of making investments in the country." While Marchionne said Fiat can manage his investment plan on its own, he would consider another alliance if the right opportunity arises. Without identifying potential partners, he said he sees the possibility of a merger that would create a company larger than Toyota Motor Corp., the world's biggest carmaker. "The industry needs it," Marchionne said. "This is still a very fragmented industry for the level of capital you have to invest." If such a deal happens, Marchionne doesn't expect to stick around beyond 2018 to make it a success. He says he's grooming several members of his team for the top job since Elkann says he's not interested in combining the chairman and CEO titles. "You're asking me if there are other things I like to do apart from this? Phenomenally, yes," Marchionne said, lighting another Muratti. "I like to be able to think, and that's not always possible in this job."